And coming up - we'll have the weekend's bad news about all those murders - but first we go to Punta Gorda. It's been a little over 2 weeks since Mario Vernon the Third was shot and killed by Police Constable Tevin Aranda in that southern Town. He's out on bail for a manslaughter charge, but his family and friends are not satisfied. They say that he should be facing a murder charge for the death of the 24 year-old. 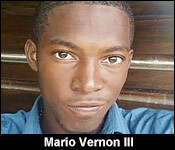 At around 9:00 on Saturday, friends and family members of Mario Vernon started gathering in PG Central Park. Though it had been raining the night before, and the overcast sky looked ominous, they continued with preparations. About 30 or so protesters lined up and began marching through the principal streets of PG. As they moved along, their chants for justice grew louder, until they stopped in front of the town's police station, shouting as hard as they could. Police insisted that they march along, and respecting the request, they moved. 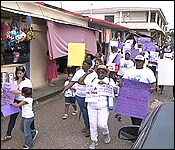 Though it was not a grand protest by any measure, participants were still able to send their message loud and clear. 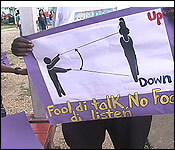 And, if town residents didn't hear them, they surely would have seen their protest posters. There were illustrations like this one, showing the stark difference between a deadly shot to the head, and a shot to the leg, which would have subdued the victim. There was this one, depicting the dissatisfaction with the manslaughter charge for Constable Tevin Aranda, instead of murder, which townspeople were demanding. 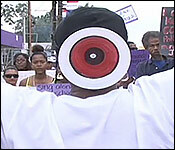 Others wore what looked like bull's eye targets to the back of their head, the same place where the officer shot Vernon. This aunt of Mario Vernon kept her hands up for as much of the walk as she could, demonstrating the account from eyewitnesses that he was surrendering to Constable Aranda when he was fatally injured. The demonstrators displayed a wry sense of humor, and they were as respectful as they felt necessary, given their anger and disappointment. We got the sense that comic relief was part of their coping mechanism for the tragedy and loss. "We know about community policing. We know about meet and greet, but I was shocked to hear about dodge and kill. What in the world is that? We don't want dodge and kill. Do we want that?" "No more dodge and kill!" 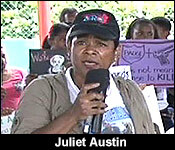 "And we are here because the way my nephew died was a way that not even an animal you kill that way." "You cannot, and should not shoot anyone from behind. If they said they're running from you, it makes it even worse. But, we are not used to execution style in Punta Gorda. Does who should be the ones who should uphold the law, they are now becoming the breakers of the law." "When somebody shoots another person from the behind the head, and the person dies in the freeze position, that is bloody murder. Murder! Nobody, regardless of who you are should get a slap on the wrist and be charged only with manslaughter. Manslaughter my neck! My nephew is dead! No cop is above the law. 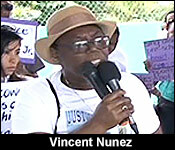 No citizen of Belize is above the law." "When you have corrupt officers that are not giving justice, citizens tend to take it into their own hands, and get their own justice. We don't want to have to go there." "An execution is when they shoot you in your back, or in the back of your head. That is an execution, and not even in war it is allowed. 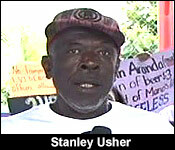 And we want those charges to be upgraded, to murder!" "We stand for justice, and everywhere I go, as long as it's casual day, I will wear my shirt until "Jun" gets Justice!" Another key issue to the aggrieved residents of PG is the question of this weapon which police claim to have found on the scene of the shooting. Up to last week, police still couldn't say with certainty that this weapon was his. On Saturday, the family of the deceased once again asserted strongly that the weapon was planted. "Mario's scene was staged. Where did the illegal gun come from? That is telling me that the policemen have all the damn illegal guns!" But the latest affront, is the allegation that Police have been fund raising for Constable Tevin Aranda's defense attorney. 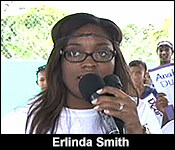 "I have seen the police department, they raise funds to help when others are sick. That is fine. We understand that. To raise funds for their colleagues when they are in distress and problem; that's the way it ought to be. 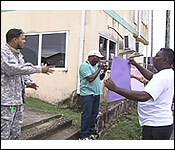 But, I have never seen police formations raising funds for a police that is charged with a criminal offense." 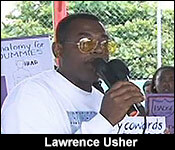 "Moreover, it is a shame that these cops are raising funds to defend the killer. What does that say? Birds of a feather flock together." "We passed yesterday, the men were having barbecue sale. Shame on them! Shame on them!" 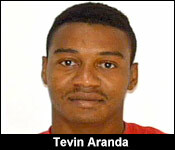 And if one of the eyewitnesses would have his way, Aranda will have his full day in court. 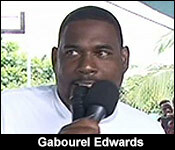 He's Kevan Wade, and since the shooting happened, he's been granting off-camera interviews. Well, on Saturday, he stepped forward for the first time so that the country could see his face. He and the aggrieved PG residents are hoping that the unwanted publicity will afford him some protection from the dangers of being a witness against Aranda. 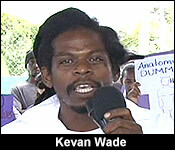 "My PG people, I am Kevan Wade, one of the witnesses to what happen to Mario. And, for the past couple days, I have been receiving threats, unknown phone calls, threatening me. They come through my house for the week, everyday, 2 times. So, for the week, that's about 12 times. So, they are trying to intimidate me in a certain kind of way. Mario died innocently! I personally saw what happened to Mario, and if it was my brother, and he killed my friend like that, personally, I would have to talk because I stand up for the right thing. That's why I have never been in the law's hands. So, all I am telling my people is if I die, you know who it is. I won't call any names. So, you know something? You know what they like to do with key witnesses. Well, this is one key witness who you will not catch. You will not see me. You will not hear from me. You all want to kill me, 6 Main Street; that's where I live; In my house." Even Mario Vernon's mother, who's been silent since his killing, stepped forward to face the police department publicly. 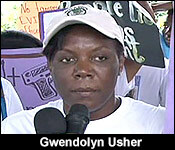 "I'm not going to talk about the inconsistencies in the report that they gave when they murdered my only son. That was my only son. I only have 2 children, and now, I only have 1 daughter. So, I am going to fight to the very last, even if I have to spend my last penny, to see that justice is served, not only for my son, but for others. And I am going to take this negative thing that happened, and look at it from a positive point of view." There was also a general rage against police in the south that appears to have been simmering for some time. "What we know, and what we have heard, from the mouths of the very horses is that 'PG' is 'Poison Ground', and they send cops who give trouble to PG for punishment. We deserve better than that." "For those good cops, we want to thank you for standing with us. 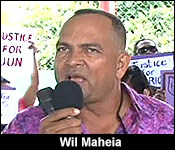 And, for those bad cops, Mr. Prime Minister, do your job. Clean them up! Get them out of Punta Gorda Town!" "After those charges get upgraded, we want all those police who were doing disruption and corruption, and cover up, and all those things - playing with the crime scene back there - we want all of them out of PG. We deserve better." "They feel like their job is to walk around and pull a trigger. Anybody could do that. All of the kids can do that. 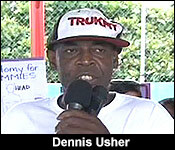 We want responsible, respectful people who will be manning the streets, and who will be protecting us, not killing us." "We should know the background of every cop who comes to Punta Gorda, and I am saying this because not every cop is a bad cop. We have good cops, and we have bad cops. But, the bad cops, we don't need in our town." "We will not! We will not be unruly. We are law abiding citizens, and we will stand up." At its height, there were a little more than 50 protestors.